A woman with a serious seafood allergy ended up getting hospitalised after she was served shellfish despite informing the staff at a restaurant in Jurong Point of her allergy. Facebook user Huijin Jinnie posted what happened to her after visiting the Soup Restaurant outlet on Sunday (June 17). She wrote that she "specifically" told the restaurant's staff that she was allergic to seafood and requested for dishes that did not have any in them. She added that she doubled checked again with a waiter when she was served spinach with three eggs who told her that there was no seafood in the dish. After taking a few mouthfuls, she began to feel "weird". She wrote: "...found shreds of [unknown] ingredient that looked like scallop. "Asked again and the waiter [denied] there was any scallop and said it's just shredded egg." As she grew increasingly uncomfortable and her skin started to itch, she said that her eyes started swelling as well. 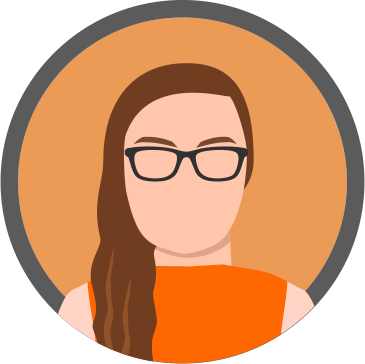 "Asked another waiter and kinda got brushed off till the 4th time the waiter finally agreed to ask the kitchen after I [emphasised] it looked like scallop [and] I am allergic to shellfish." Eventually, the waiter came back to tell her, "oh they put a little bit inside only". Huijin said at that point, she felt her heart start to race and could not even reply the waiter. She said that her mother brought her to a General Practitioner (GP) before she ended up in the Accident and Emergency (A&E) department of Ng Teng Fong Hospital where she was put on a drip and given an injection. In her post, Huijin highlighted the "serious lack of awareness" restaurants and food vendors have of food allergies in Singapore. "Food vendors should know that one careless mistake can be life-threatening. "I'm considered lucky to end up on a bed at A&E. "There are people who die from this." Soup Restaurant Singapore responded to Huijin's post and apologised for what happened, emphasising that they are taking the matter very seriously. "We are reviewing our practices at all our dining outlets and have taken immediate steps to remind our staff of how severe food allergies can be. "We will also ensure that practices are in place to highlight food allergies to the kitchen team to prevent such incidents from recurring. "Once again, we are very sorry for this incident and apologise again for this episode." In response to Stomp's media queries, a spokesman from Soup Restaurant acknowledged that "severe service lapses" were made by the outlet's staff. 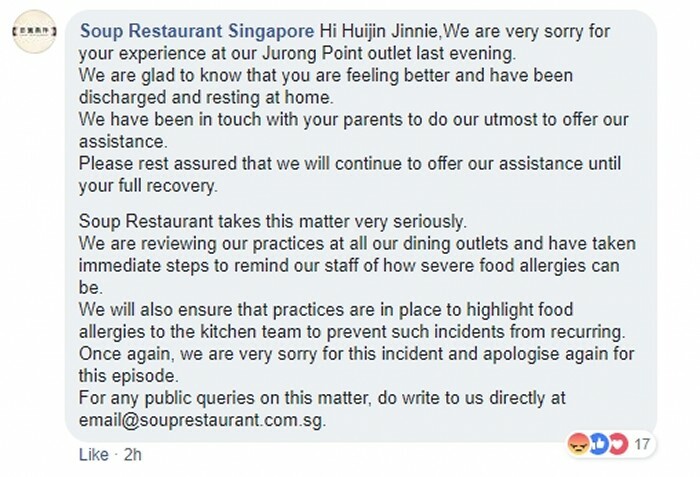 "The reported food allergy incident at Soup Restaurant Jurong Point outlet last evening serves as a reminder to all F&B outlets of how severe food allergies can be. "We have visited our diner and her family and are glad to know that she has been discharged from hospital. "We have offered them our support and assistance until her full recovery. "The staff involved were called up early this morning to provide explanations for this incident. "We have identified that there were severe service lapses on the part of our frontline staff. "Our management team also took immediate steps to inform the staff at all our outlets of this incident. "All outlets were alerted and reminders were sent out to remind our staff of how severe food allergies can be and to ensure any food allergies are highlighted to our kitchen team. "Soup Restaurant is a home-grown food and beverage company and we take the issue of food allergies, which has become more prevalent in Singapore, seriously. "We will continue to review our practices at all our dining outlets. "Regular training will be conducted to elevate the understanding of food allergies amongst our staff to prevent the incident from recurring. "We deeply regret that this has happened and will strive to do better in future."